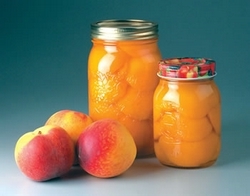 Combine peaches and water in a large saucepot. Cook gently for 10 minutes. Add sugar, stirring until dissolved. Bring slowly to a boil. Cook rapidly to gelling point, about 15 minutes. As mixture thickens, stir to prevent sticking. Remove from heat. Skim foam if necessary. Ladle hot jam into jars, leaving 1/4 inch headspace. Adjust 2-piece caps. Process in boiling water.